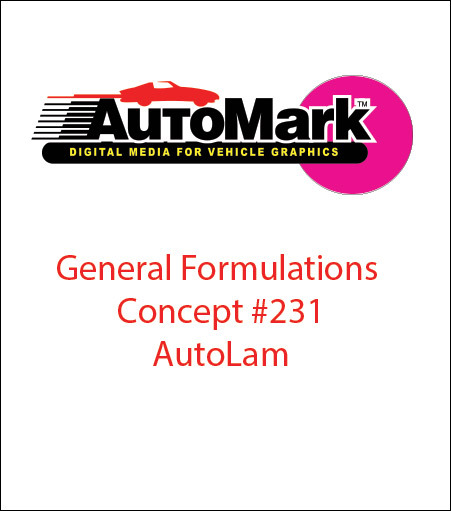 General Formulations® 231 Gloss Overlaminating Film is a conformable pressure sensitive 2.4 mil gloss clear PVC film with the optically clear permanent acrylic adhesive on kraft 53# over laminate liner. This vinyl film offers protection from ultra violet radiation, moisture and other environmental exposures. It is laminated by the cold laminating process without the addition of heat. Gloss overlaminating vinyl film is designed to protect digital image prints and screen printed images for vehicle wraps and graphics, exhibit and display graphics. Can be used in most instances where an overlay with a gloss finish is required. Recommended for use with Automark™ 230.